Prime Minister Tillman Thomas has expressed “deep sadness” at the passing of his Cabinet colleague and Minister for Agriculture, Forestry and Fisheries, Hon. Denis Michael Lett. He praised the 74 year old for his contribution to his church, community and the government, especially his leadership in expanding the contribution of Agriculture to the Gross Domestic Product (GDP) from 5.2% in 2008 to over 7% in 2012. “I always respected Mr. Lett, especially for his public service and his contribution to his community,” the Prime Minister said Monday morning within hours of learning of his passing. “On behalf of the Government and people of Grenada, I extend sympathies to his family, his friends and those with whom he worked at the Ministry of Agriculture. We are all affected by the loss of this illustrious son of St. David,” the Prime Minister said. The Prime Minister noted that the farming community “greatly respected” the Minister for Agriculture, who was the main architect of the farmers’ market project, which strengthened the link between the Tourism industry and the Agricultural sector. The project also provided an avenue for farmers to market their produce directly to customers. 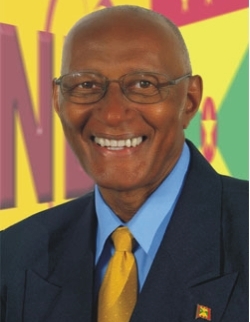 Mr. Lett served as Minister for Agriculture since July, 2008. He was appointed to act as Prime Minister as various times during the last five years. He died on Monday following a long period of illness with prostate cancer. As a former Parliamentarian and a sitting Minister of Government, Mr Lett qualifies for a state funeral.